The Karoo is known for being a destination for anyone in search of a great venue to relax and unwind. Perhaps it is the history that permeates every corner of South Africa’s fourth-oldest town, or it is the incredible nature that beckons travellers from all walks of life looking for an escape from the bustle of their daily routines, because one thing is sure, you step into a quaint town unaffected by modern-day stresses. With its beautiful Cape Dutch architecture, Graaff-Reinet is the perfect venue from which to experience the Karoo, and to relax with luxurious self-catering accommodation. The oldest town in the Eastern Cape, and certainly the one with the most atmosphere, Graaff-Reinet lies nestled in a bend of the Sundays River. It is overlooked by the rocky Sneeuberg mountain, with the famous Camdeboo National Park in the background. More than 200 buildings claim National Monument status, and a whole street was recently restored, including its slave cottages, so Graaff-Reinet is basically a living monument to times gone by. It managed to retain much of the character of a typical 19th-century town and even just this makes it worth a visit. Book your stay and relax in Graaff-Reinet with our top-quality self-catering accommodation, and make us your base for exploring the entire surrounding Karoo region. Our self-catering accommodation is in the heart of Graaff-Reinet, in a beautifully restored home with seven units. Whether you are merely passing through, or lingering in town a while, we look forward to welcoming you to our luxury accommodation. Here you can rest and rejuvenate as you regroup after your travels and exploration, and you can do so in the lap of luxury. Graaff-Reinet is known as a quaint little town in the Karoo, with enough charming shops, fascinating museums, and celebrated restaurants to surprise and delight even the most experienced traveller. Best of all, our luxurious self-catering units are located near most of the town’s biggest tourist attractions. In fact, we are situated within walking distance of most shops, museums, and restaurants, making it even more convenient to book your stay with us. Each of our seven self-catering units has its own private entrance and a stylishly decorated interior. We made sure to provide each unit with the finest quality bedding and linen, and our modern kitchenette appliances make it a pleasure for guests to take care of their own catering. Look forward to staying in touch watching DStv, and enjoy recuperating in our spotless en-suite bathrooms after an exciting day of adventures. Enjoy the Karoo hospitality while you relax in our self-catering accommodation, and book your stay today to avoid disappointment. To learn more about our self-catering units, the available facilities, and any other information about KarooRus or Graaff-Reinet, contact us today. We are always at hand to answer any questions you may have, and to make your decision to stay with us an easy one. It is tough searching for a place to book your stay in a strange town that you have never been to. How do you make sure you are actually getting what you are paying for? Nothing can be more deflating than travelling for many hours on the road, only to end up at your destination and realising you have been duped, and the accommodation you thought you booked and secured does not live up to expectations. How can you avoid becoming one of the unfortunate people who have suffered this type of disappointment? When searching for and booking self-catering accommodation in Graaff-Reinet, you can do this by starting your search online. While this might still not seem like an obvious solution, given what we said about how difficult it can be to be sure what you are getting when booking online, there are ways around it. 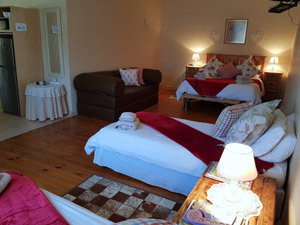 By starting your search for self-catering accommodation in Graaff-Reinet online, and knowing where to look, you can be sure you will find legitimate and luxurious accommodation providers that fit your needs. Let us take a closer look at how you can make sure you know who you are dealing with, and that you can book your accommodation with confidence, knowing what is waiting for you at your destination. By far one of the best ways to make sure you are dealing with a bona fide accommodation provider in Graaff-Reinet, and indeed any town in South Africa, is to use trusted online portals where you can read honest and accurate feedback and reviews. Try to stick to the well-known, widely trusted, and popular local travelling and accommodation websites. You want to book your stay with a legitimate service provider. Regardless of their level of attention to detail and focus on customer care, chances are that few accommodation providers will have a perfect score. So, if the site you are searching looks like it is a blatant marketing tool pushing a specific accommodation provider with convoluted and bloated reviews, chances are you are not going to find any accurate and truthful reviews there. Other things to be on the lookout for when deciding whether the prospective accommodation provider is legitimate is to check if they have a website, a landline contact number, an email account that is not hosted by a free service like Yahoo! or Gmail, and whether there are realistic pictures of the accommodation on the site. We are one of the top providers of luxurious self-catering accommodation in Graaff-Reinet. Our converted house, with seven private units, is located in the heart of Graaff-Reinet. For many years, we have been welcoming weary travellers in need of a place to rejuvenate and rest after their long travels. Book your self-catering accommodation in Graaff-Reinet online and secure your stay with us. If you have any questions, feel free to speak to us today. Our team is ready to answer any questions you may have. We look forward to welcoming you to our accommodation.